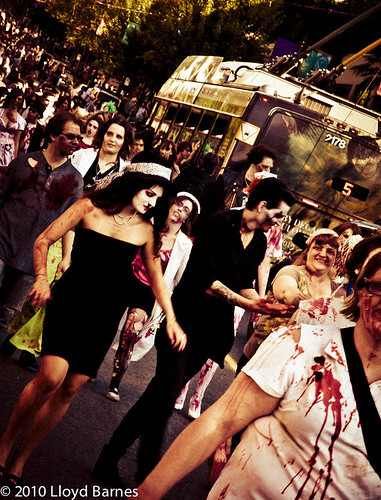 Each year the Vancouver Zombie Walk gets bigger and more popular. According to the Facebook event page, there were over 6,000 confirmed attendees. I don't know how many zombies actually showed up, but I suspect more than that! Many of the zombies also had cameras and smartphones, but with all the amazing costumes and special effect makeup, the event also attracted a lot of photographers and videographers. I was very interested in the gear that they were using! I saw a few people with HD-DSLR rigs and several with off-camera flash set-ups. Others had speedlites with various attachments to help diffuse the light. The flash set-ups were a good way to reduce the contrast by filling in the shadows. I saw one photographer with a vintage twin lens reflex camera (a Rolleiflex I think). There was some very impressive gear! I used an Olympus E-30 with the Olympus 12-60 mm lens for wide angle and the 50-200 mm for zoom. 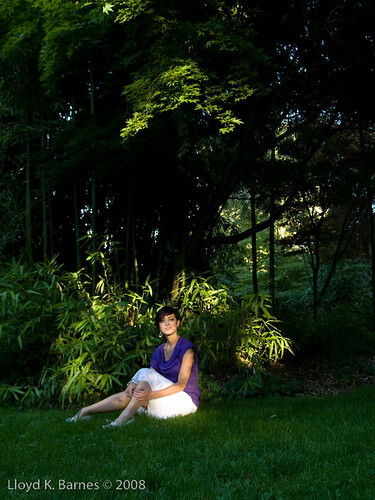 It was a bright sunny day, so I tried to find shady areas and expose for the shade. I also used backlighting and exposed for the shadow side of the zombies using centre-weighted mode. I had the in-body image stabilization and face detection on. I haven't used face detection very often. I found that it sometimes focused on the wrong place, so I probably will avoid it in the future. I set the camera to continuous (burst) shooting mode and continuous autofocus. That way I could fire off a bunch of action shots when a zombie started running towards me! For lighting, I wanted to keep it simple so went with available light only. I used ISO 200 and a wide aperture (around f/2.8 to f/3.5) and a fast shutter speed to minimize the motion blur but also isolate the zombies from the background due to the shallow depth of field. I used the fastest shutter speeds that I could to minimize any blur caused by camera shake. Here's my gallery of Vancouver Zombie walk photos on Facebook. If you were at the zombie walk, you might be in the gallery - so feel free to tag yourself and your friends! Also, feel free to share any links to your zombie walk photos as well as any tips about how you photographed the event. I'm looking forward to Zombiewalk 2012! 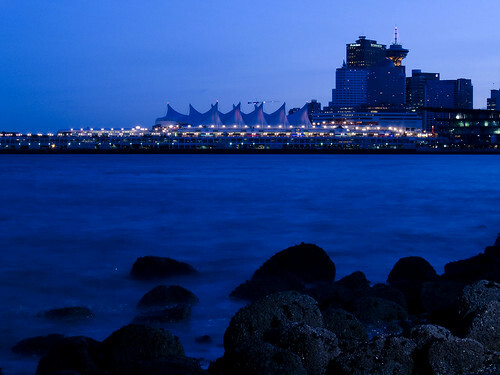 On May 26, 2011, Vancouver CAPIC (The Canadian Association of Professional Image Creators) sponsored a presentation by Heather Morton on taking risks to adapt to the changing and competitive photography market. Heather also included video clips from Selina Maitreya, Heather Elder and Miki Johnson, further expanding on the theme of risk taking. The presentation was followed by a panel Q&A with Eric Arnold of Dare Vancouver and Nora Ahern of Village and Co., both from advertising agencies in Vancouver. As an emerging photographer, I was very interested in Heather's talk! 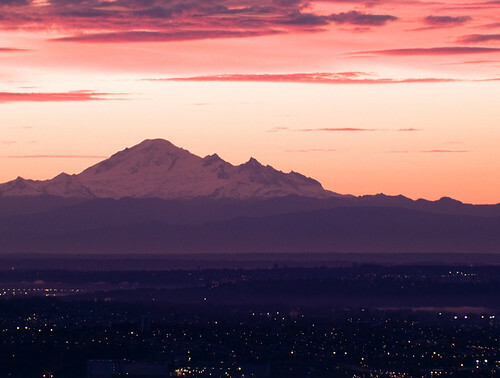 After 3 years of study, I recently completed the courses for the Photography Certificate at Langara College, and I'm now working on developing my style and vision. I've been shooting and getting as much experience as possible, developing my portfolio and embracing social media by blogging and using Twitter, Facebook, Tumblr and Flickr. Most of the Q&A panel discussion was on the use of social media, which is becoming a key part of photographers' marketing efforts. 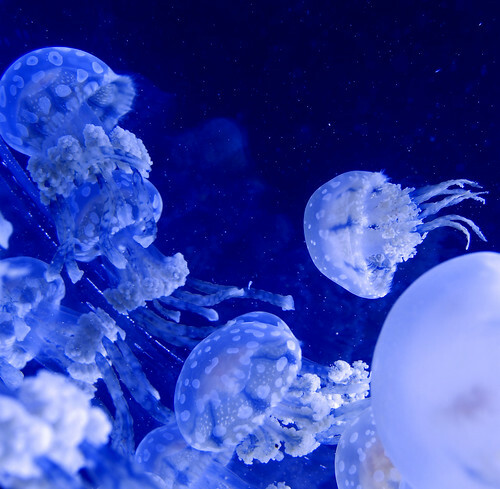 Heather started with a quote from photographer Chase Jarvis: "Take the pictures that no one else can take." The first step in successful marketing is to have a unique vision. A couple good examples of visionary photographers are Andrew B. Meyers and Chris Buck. According to Selina Maitreya in a video clip, the photography market is increasingly becoming divided into low-end and high-end markets, with the high-end being defined by photographers with a singular vision. What does "vision" encompass and how does a photographer develop their vision? Heather's advice is to tell the story of you as a photographer. Vision needs time to develop. Take the risk of following your vision rather than following the latest trends. E-mail blasts and print promos are hard to get through these days. The volumes are too high for busy creatives to spend time on, and company spam filters stop a lot of e-mail. Printed portfolios are rarely called in anymore. So what can a photographer do? Some are taking risks with promos that are highly targeted and creative. A great promo will get attention and may result in a tweet, blog post or shout out. Effective use of social media is an important part of the strategy. Promos should reinforce your vision about who you are as a photographer. Heather Elder said in a video clip that blogging and telling the story are very effective promotional tools. Also, face-to-face meetings with potential clients are still highly effective. Miki Johnson explained via video clip the importance of a blog to give a personal face to your work. Diversify yourself beyond your traditional offerings. Travel to new locations and open up to new opportunities such as social media and video. As Heather Elder said, photographers should see themselves as directors, content providers, application designers, and visual image makers. Some photographers are marketing to other photographers, for example David Hobby (Strobist) and David duChemin (Pixelated Image), who teach seminars, sell books and have popular blogs in addition to selling their photography. Try new things, such as iPhoneography and video. Keep learning. Try different genres of photography. Experiment and practice until you have it down. Push yourself and don't be afraid to go in new directions. Trust yourself and get out of your comfort zone. It helps if you can share the risk with the client! Selina Maitreya's advice was not to work from fear. Stop chasing trends. Sometimes you may have a great creative opportunity that is worth doing for awards and recognition, not just the fee. Look at your quotes and see where you can trim excess to help meet the client's budget. If the job comes in, say yes and figure it out! Scout locations yourself, test out everything and get your hands on all aspects of the shoot. Pool your resources and expertise with other photographers, videographers, animators and web developers. Collaborate with clients. Take a risk to be open and share your ideas, suggest treatments in your quotes. Overdeliver. Stay passionate about photography by shooting every day. Interact and engage the world with your camera. Be curious. The major theme of the Q&A session was about the increasing importance of social media. It takes a significant amount of time and the results may come slowly, but it is necessary to use the various social media sites as they are channels to promote your work and vision. Here is a summary of the Q&A session. 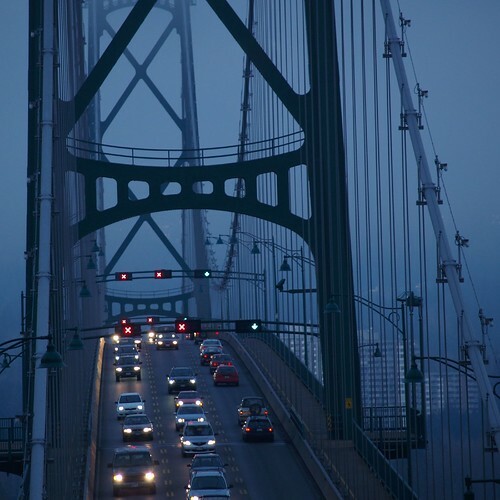 Here's the liveblogged event by CAPIC Vancouver. Daphne Chan Photography post about the event. Recap and opinions by Kamil Bialous photography. 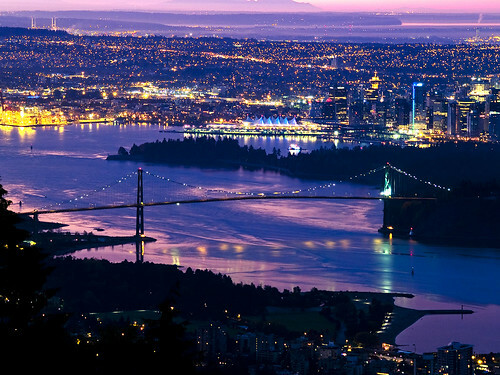 The first annual Urban Culture Conference is going to be held in Vancouver August 27-28, 2011 and it looks like it will be a very cool event with arts, music, food and entertainment featuring Vancouver's local talent. 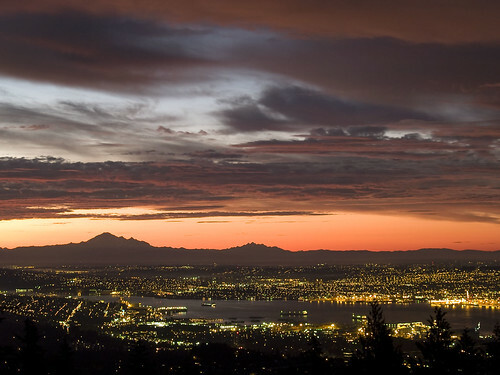 Right now there is a competition for the best of Vancouver in a bunch of different categories, including photography. I'm nominated and would love it if you took a couple of minutes to vote. Thanks! I'm hoping to get enough votes to stay in the running by June 1 when the selction of candidates will be narrowed down. There are a lot of other categories to vote on (you can vote once per category) so browse and support Vancouver's talent! 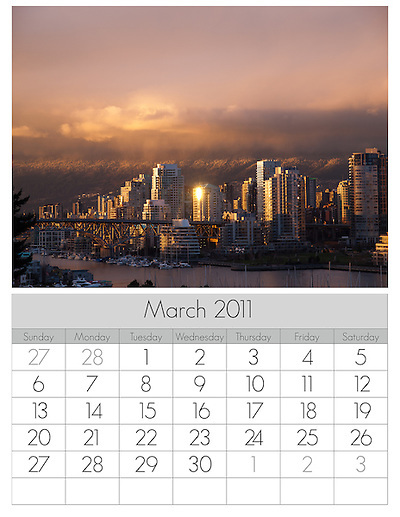 Last month I posted a calendar page for February 2011. Here’s the next one for March 2011. 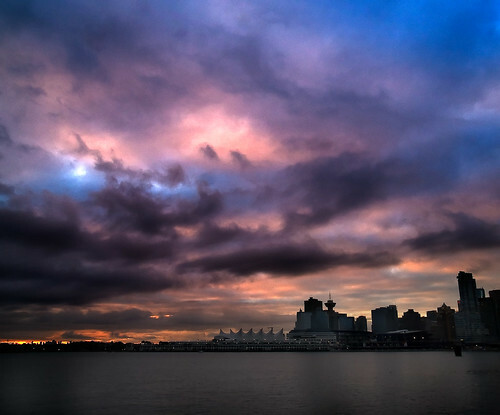 It’s a view of downtown Vancouver after a rainy day – the clouds began to clear at sunset to create some amazing light! When you click on the link there will be a short contact form and a Facebook “Like” button. Once you submit the form you will be taken to the calendar. Click “Add to Cart” to get it. You won’t be charged – it’s free! I am offering it under the Creative Commons license, which allows you to share, print or transmit as long as it is for non-commercial use and you credit Lloyd K. Barnes Photography. I have been so busy in 2011 that I haven’t got myself a wall calendar yet! So I was just reading a post on Adobe Photoshop Lightroom Killer Tips about using Lightroom to create wall calendars and found an amazing preset for making 2011 calendars. Check it out! 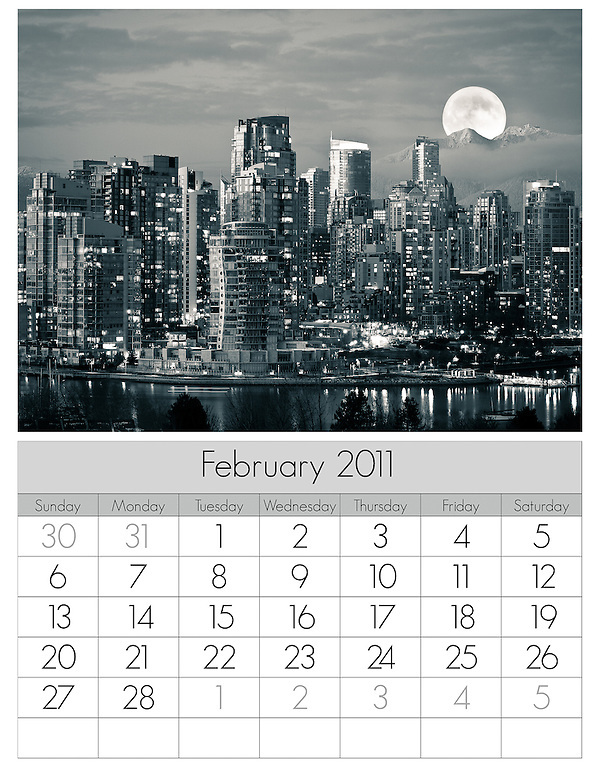 I used the preset to create this calendar page for February and printed it to hang on my wall. You can download a copy for yourself if you like it. 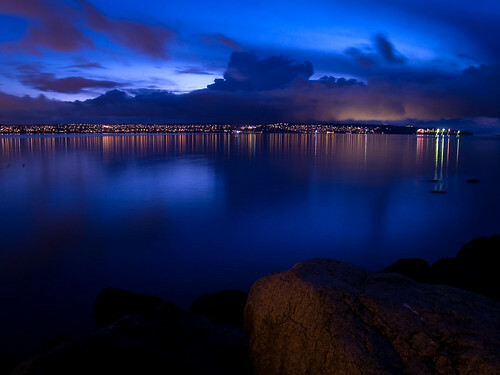 It’s a beautiful view of Vancouver at night. Vancouver Cityscape Calendar February 2011 by Lloyd K. Barnes Photography is licensed under a Creative Commons Attribution-NonCommercial-NoDerivs 3.0 Unported License. If you want more pages for the rest of 2011 let me know by commenting! 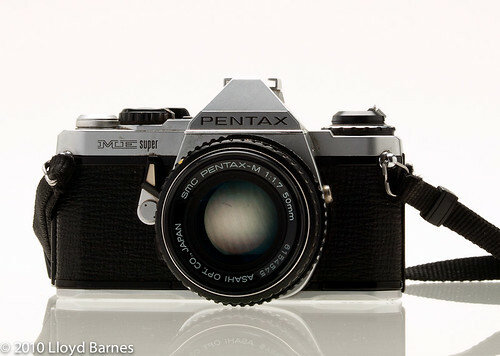 The Pentax ME Super featured aperture priority automatic mode and TTL light meter. It also has a fully manual mode and syncs at 1/125 s. It was a manual focus camera and used the Pentax K mount lenses. 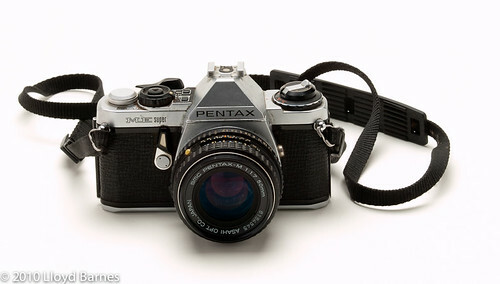 The camera shown above is equipped with the Pentax 50mm f/1.7 lens. It was a very popular camera with advanced amateur photographers. I was at the Vancouver Zombiewalk on Saturday August 21, approved and was amazed at the incredible costumes, makeup and huge number of zombies! Of course, sildenafil with such great subjects to shoot, there were a lot of photographers too! It was a lot of fun – like Halloween but in the summer. Click here to see more photos from the walk. I used Lightroom 3 for post-processing and decided to go with a gritty retro look. If you want to try it out, feel free to download the preset. You can find instructions for installing presets at the Digital Photography School. Leave a comment if you like this preset!